From rock and roll to symphony orchestra, concert lighting helps musicians to connect with their audience. Great design and flawless execution create an aura around musical performances that pulls audience members in on an emotional level, connecting them with the music in ways that can’t be accomplished merely through sound. As the saying goes, a concert without lights is just radio. Theatrical Lighting Connection has been providing concert lighting equipment to local venues and touring performers for over thirty years. 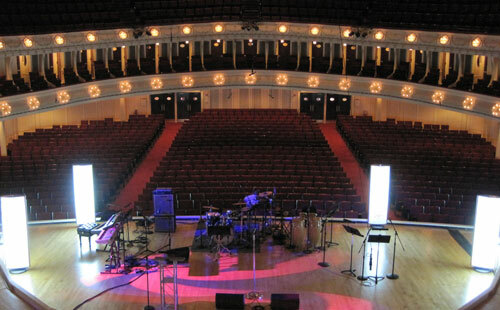 Venues such as Ravinia Festival and performers including John Legend, the Chicago Symphony Orchestra, Maroon 5 and others have relied on Theatrical Lighting Connection to make their performances shine. Whether your performance requires the warm presence of an evenly balanced stage wash, a flexible scenic environment composed of streaming media on LED panels, or a flashy extravaganza utilizing beams, shadows, fog effects and strobes, Theatrical Lighting Connection is your source for concert lighting solutions.